NIN Recruitment 2019: National Institute of Nutrition (NIN) / ninindia.org is conducting recruitment processes to fill 1 vacancy. As of now, there is one recruitment drive going on for Walk in for JRF Post. 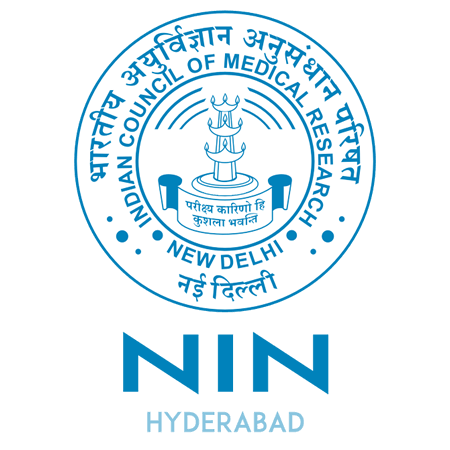 NIN Recruitment 2019 - Walk in for JRF Post on a project entitled "Alleviating Effect of Micronutrient Combinations in Improving the Differentiating Potency of Human Brain Cancer Stem Cells: an explorative mechanistic Study" in NIN, Hyderabad, Telangana. Candidates are invited by National Institute of Nutrition (NIN) to attend walk-in-Written Test/interview to be held on 23 Apr 2019 09:00 AM and 09:30 AM for 1 vacancy. NIN Recruitment 2019 - Walk in Written Test/ Interview for JRF & Lab Attendant Posts on a project entitled "Understanding the Role of Vitamin 812 in Diabetic Neurodegeneration: Implication of Protein Quality Control Processes" in Department of Health Research, NIN, Hyderabad, Telangana. Candidates are invited by National Institute of Nutrition (NIN) to attend walk-in-interview to be held on 15 Apr 2019 09:00 AM for 2 vacancies. NIN Recruitment 2019 - Job notification for JRF (PDF) Post on a project entitled ''Maternal exposure of endocrine disrupter Biphenol A : implication to development programming of glucose homeostasis and insulin resistance in the fetus'' in NIN, Telangana. Applications are invited by National Institute of Nutrition (NIN) on or before 07 Apr 2019 for 1 vacancy. NIN Recruitment 2019 - Walk in for RA, PT III & MTS Posts on a project entitled 'Efficacy of Peanut - Pearl Millet bar supplementation on gut Modulation and Iron Status among anaemic adolescent girls"and "Effect of National IFA supplementation Programme on Modulation and Iron Status Markers among Adolescents in NIN, Hyderabad. Candidates are invited by National Institute of Nutrition (NIN) to attend walk-in-interview to be held on 21 Feb 2019 09:30 AM for 3 vacancies. NIN Recruitment 2019 - Walk in for Consultant, PA & Other Posts on a project entitled "Impact evaluation of 'screen and treat' approach for anaemia reduction : a cluster randomized trial in rural Telangana" in NIN, Telangana on Contract Basis. Candidates are invited by National Institute of Nutrition (NIN) to attend walk-in-Written Test/Interview to be held on 14 Feb 2019 at 09:30 AM to 10:30 AM for 7 vacancies. NIN Recruitment 2019 - Walk in for Consultant, PA & Other Posts on a project entitled "Impact evaluation of 'screen and treat' approach for anaemia reduction : a cluster randomized trial in rural Telangana" in NIN, Hyderabad, Telangana on Contract Basis. Candidates are invited by National Institute of Nutrition (NIN) to attend walk-in-Written Test/ Interview to be held on 13th & 14 Feb 2019 10:30 AM for 7 vacancies. NIN Recruitment 2019 - Walk in for Project Technician/ (PA) Post on a project entitled "Effect of Fortification of Edible Vegetable Oils with Sesame! Rice Bran Oils or with Sesame Lignans on the Thermo Oxidative Stability of Repeatedly Heated Oils" in NIN, Hyderabad, Telangana on Contract Basis. Candidates are invited by National Institute of Nutrition (NIN) to attend walk-in-interview to be held on 05 Feb 2019 at 10:30 AM for 1 vacancy. NIN Recruitment 2019 - Job notification for JRF Post in NIN, Hyderabad, Telangana. Applications are invited by National Institute of Nutrition (NIN) on or before 15 Feb 2019 for 1 vacancy. NIN Recruitment 2019 - Walk in for Technical Assistant Post in NIN, Telangana on Contract Basis. Candidates are invited by National Institute of Nutrition (NIN) to attend walk-in-written test/interview to be held on 01 Feb 2019 10:30 AM for 1 vacancy. NIN Recruitment 2019 - Walk in for Consultant - Ayurveda Physician Post on a project entitled "Correlation of Prakriti (Ayurgenomics) with Dietary Patterns, Gut Microbe, HLA-DR(31 Gen&s and Disease Severity in Rheumatoid Arthritis Patients" in NIN, Hyderabad, Telangana on Contract Basis. Candidates are invited by National Institute of Nutrition (NIN) to attend walk-in-interview to be held on 23 Jan 2019 at 10:30 AM for 1 vacancy.